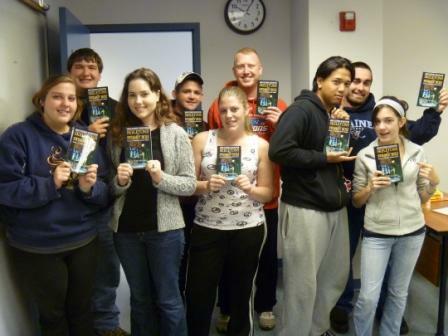 I had the amazing privilege of speaking to an English 102: Literature & Composition class out at Bristol Community College in Attleboro, Massachusetts, a couple of weeks ago. The class read my short story “Doors” as part of their curriculum. It was really wonderful to hear their insights on this piece that’s become one of my favorites. They were enthusiastic, too, as you can see-here they are posing with Skeletons in Swimmin’ Hole! Not too bad for eight o’clock on a Friday morning!